Student lives can get quite busy, especially towards the end of the school year. Term papers, tests and many other things can overwhelm even the best students out there. This is why essay-writing services like EduBirdie exist. They help students out and allow them to have some free time. However, not all of these services are legit and some of them can prove to be a scam. This is why we’ll review Edu Birdie and determine if an average student can trust it. The website takes some time to load, probably due to all the media features like images, special effects, videos etc. When it does load, it displays a good-looking home page, which gives a lot of information on the service, how it works and what it offers. There is a chat bot available for all of your additional questions. However, the site doesn’t display any information on the company itself or how to reach them other than by the contact form on their support page. The order process is quite interesting since it`s separated into three parts, all of which are specifically related to your essay. 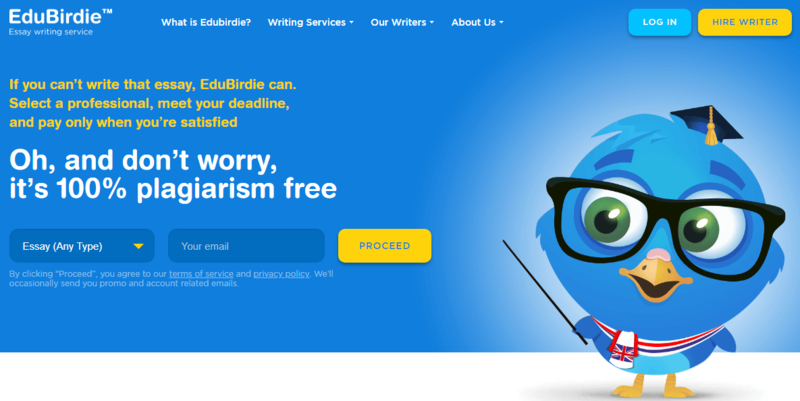 EduBirdie will require you to register a new account or login to be able to bid and hire writers. This is a different process than what is usually the case, but it can also be confusing to new users. Edu Birdie doesn’t really offer clear information on the pricing that they have. There is also no information on available discounts. The only possible way to learn about the prices on uk.EduBirdie.com is through buying an essay. Luckily, you don’t have to pay until you are completely satisfied with your essay. However, it would be much more reassuring if the prices were clearly displayed and there were some discounts, deals, promos or coupons to speak of. There is no information on refunds as well. Edu Birdie is transparent about their writers. They state that the writers are highly educated experts and you can even see all of their information and their ratings on the website. You can choose a writer that suits your needs the most or let them pick a writer for you, which is a cheaper option. Despite being so open about the writers that they hire, there are no available examples or proofs of quality on their uk.EduBirdie.co website. There are some testimonials but they don’t offer information on what the source of those testimonials is. EduBirdie may look professional and legit in the beginning but once you are in need of more information and reassurance, they start looking more and more like a scam. For that kind of money, there are better essay writing services out there with the simpler process and higher quality of work.